Yesterday, I talked about global forest die-offs, and Porsena made some more comments on the Mountain Pine Beetle epidemic. I had seen affected forests on vacation in Wyoming a couple of years ago, and I dug further into the situation this morning. This post collates maps of the epidemic in as many states as I can find - click on each map for a bigger version, and in many cases you can follow my links to get even more detailed versions. 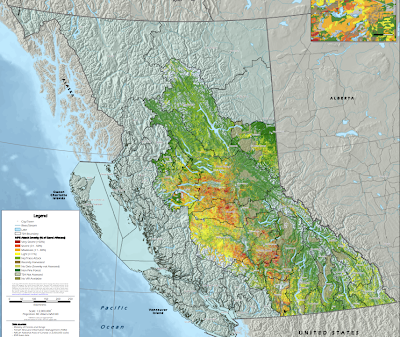 First up (above) is British Columbia as of 2008. The mountain pine beetle (MPB), Dendroctonus ponderosae, is a species of bark beetle native to the forests of western North America from Mexico to central British Columbia. It has a hard black exoskeleton and measures about 5 millimetres, about the size of a grain of rice. 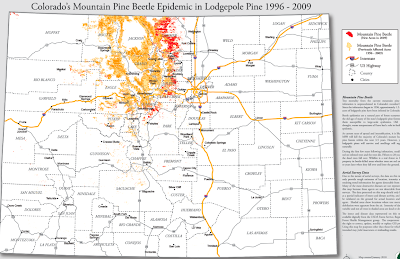 Mountain pine beetles inhabit pines, particularly the Ponderosa Pine, Lodgepole Pine, Whitebark Pine, Scots Pine and Limber Pine. The bristlecone pines and pinyon pines are less commonly attacked. During early stages of an outbreak, attacks are limited largely to trees under stress from injury, poor site conditions, fire damage, overcrowding, root disease or old age. As beetle populations increase, the beetles attack the largest trees in the outbreak area. The beetles kill the trees by boring through the bark into the phloem layer on which they feed and in which eggs are laid. Pioneer female beetles initiate attacks, and produce pheromones which attract other beetles and results in mass attack. The trees respond to attack by increasing their resin output in order to discourage or kill the beetles. It isn't the number of pitch-out tubes that kill the pine tree but the beetles carry blue stain fungi which, if established, will block the tree resin response. Over time (usually within 2 weeks of attack), the trees are overwhelmed as the phloem layer is damaged enough to cut off the flow of water and nutrients. In the end, the trees starve to death, and the damage can be easily seen from the air in the form of reddened needles. 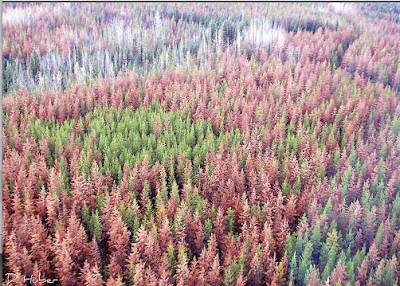 Entire groves of trees after an outbreak will appear reddish for this reason. Usually, the older trees die first. After particularly long and hot summers, the mountain pine beetle population can increase dramatically, which leads to the deforestation of large areas. There's also this helpful article from the USDA Forest Service, and there's even a blog, Mountain Pine Beetle, devoted just to the beetle epidemic. 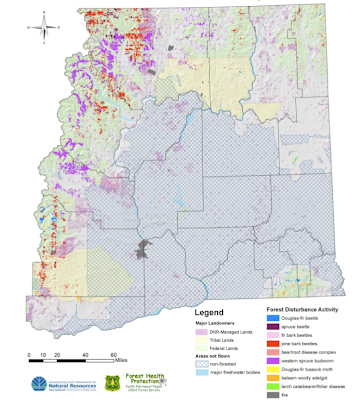 Washington has nearly 22 million acres of forestland. In 2009, over 1.73 million acres of this land contained elevated levels of tree mortality, tree defoliation, or foliar diseases. This is an increase from the 1.36 million acres reported in 2008. Similar levels of damage were observed in 2006. Previous annual totals were: 2007: 1.4 million acres 2006: 1.9 million acres 2005: 1.5 million acres. Drought conditions and warm, dry spring weather tend to increase tree stress and insect success, driving acres of damage up. 2009 was an abnormally dry year for eastern Washington with moderate drought conditions in north central Washington. Areas with major wildfires in 2006 that were not surveyed since these events, temporarily decreasing acres of damage, are now being surveyed again. Almost 6.4 million trees were recorded as recently killed. Defoliation by the Douglas-fir tussock moth increased to more than 3,500 acres in 2009 from 300 acres in 2008. The outbreak covers numerous discrete areas east and west of Oroville in northern Okanogan County. A buildup of parasites and virus in the tussock moth population may slow the expansion of defoliated acres in the Oroville area in 2010. Very light defoliation and egg masses have been observed in the Methow Valley. In western Washington, there were almost 33,000 acres with Douglas-fir beetle-killed trees in 2009. This is the highest number of acres that has been recorded in western Washington in three decades of aerial survey data collection. Douglas-fir beetle breeding in large amounts of windthrown Douglas-fir trees from recent windstorms is likely contributing to their increased population. Statewide, there were 80,000 acres with Douglas-fir beetle caused mortality. 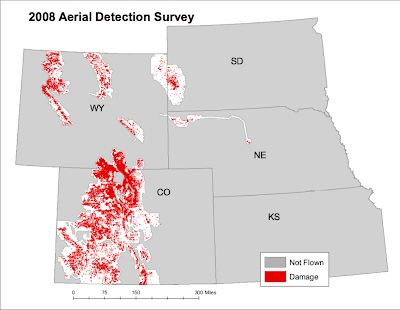 The area affected by western spruce budworm defoliation in 2009 decreased only slightly to 412,000 acres from 451,000 acres in 2008. Defoliation continues to be widespread along the eastern slopes of the North Cascades in western Kittitas County, Chelan County, and Okanogan County. As predicted by an increase in pheromone trap catches, the area of defoliation has expanded in northeastern Washington (eastern Okanogan County and western Ferry County). A previous outbreak in the Mt. Adams area and northwestern Yakima County has almost completely subsided. 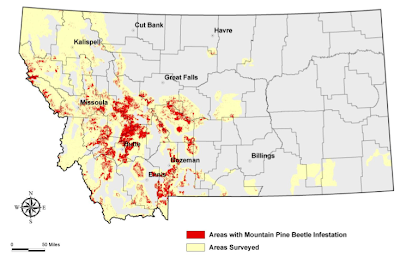 Pine bark beetle activity continues across eastern Washington where almost 420,000 acres of forest lands were observed with some current beetle-kill. Elevated levels of mortality were observed east of North Cascades National Park extending into the Loomis State Forest, on mountain ranges east and west of Lake Chelan, in mountainous areas of Ferry, Stevens, and Pend Oreille Counties, in the upper Yakama Indian Reservation, and in the Naches River watershed area. Smaller areas of pine bark beetle activity are scattered across Spokane County and the lower tree line forests of Klickitat County. There is undoubtedly more than just climate change at work here, but a thorough discussion of attribution will have to wait for another day.